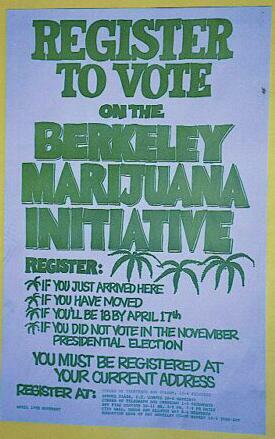 Berkeley voters strongly supported the California Marijuana Initiative in the November 1972 election. I thought a similar Berkeley measure would increase progressive turnout for the April 1973 contest and assert local control in an important area. The Berkeley Marijuana Initiative was very simple, directing the police to make no arrests for use, possession, or cultivation of marijuana, without permission from the Berkeley City Council. The initiative easily made the ballot and this April 17th Movement poster encouraged people to register to vote on the measure. The initiative won in a landslide, but lost in court. The next poster indicates how one thing leads to another.